In preparation for making the Artist’s Photo Book, it will be necessary to make a couple of preliminary mock books utilizing two common book binding practices – stab binding and accordion binding. The stab binding is a Japanese-style binding in which small holes are punched with a needle along one edge (spine) of a stack of pages (book block) and is then bound with thread. 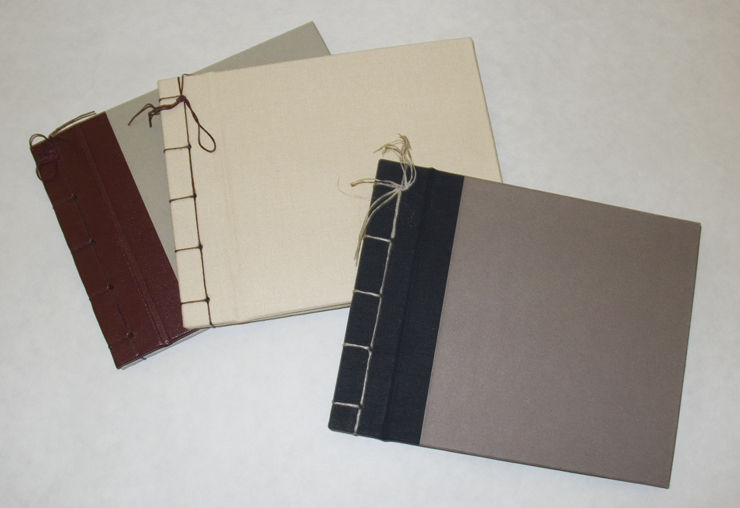 This type of binding is particularly useful in binding individual pages together and a variety of stitching patterns can be used. The front and back covers which can be either soft or hard (covered book binder’s board also known as Davey board). Click here for additional instructions on the basic stab binding technique. © Richard Avedon, Portraits published by Harry N. Abrams, Inc., in association with the Metropolitan Museum of Art, 2002. Accordion-fold (10 1/2 x 272 inches when fully-opened) and bound between two photographically illustrated laminated paper-covered boards, in a photographically illustrated slipcase. Like the stab binding technique, the accordion (or Concertina) binding also comes from Asia and was initially used to accommodate scrolls that had become unmanageable because of their size and length. The accordion book is composed of a continuous folded sheet of paper and is often enclosed between two covers which can be either soft or hard. Due to its physical nature, it can either be expanded outward and stood up or kept flat. Paper used for the inside sheets can vary from light-weight to heavy depending on presentation considerations and is folding into sheets either the same size as the cover stock or slightly smaller. If the book is to stand, it will be necessary to use a stiff paper the same size of the cover. Accordion books are great for exhibits and displays as they can be stood up and viewed from both sides. Make one mock book of each of the stab binding and accordion binding techniques. The stab binding book will be 10 pages with a hard cover and the accordion binding book will have 16 panels (8 per side) with a hard cover. As this is a technical assignment requiring in-class demonstration and hands-on instruction, the mock books will be made in class. Make one mock book of each of the stab binding and accordion binding techniques. For this technical assignment, blank paper pages will be utilized and it will not be necessary to include any photographs or text.